Tap For Credits: Tacky or No? she actually got in trouble for her snarky comment back to another commenter who was mad that she was wasting taxpayer money, but that's semantics. Most of the pushback seems to be because she tagged her expensive brand-name items. Lindy West posted "The Right Way to Brag on Instagram" for NYTimes Opinion, detailing a sarcastic list of Do's and Dont's to "help" Louise Linton and with her Instagram posting as "an easy guide" to "millenial etiquette." Lindy first notes that "the 36-year-old Scottish actress, who grew up in a castle and married Mr. Mnuchin, a multimillionaire, earlier this year, is clad in what appeared to be approximately $16,000 of luxurious cream wool crepe designer clothing and opulent accessories, which she dutifully tagged for any Real Americans currently in the market for thousand-dollar white pants." I get that it is ironic that these "Real Americans" are blind to the immense wealth and actual elitism that everyone in the current administration comes from and embraces, but the framing could have stopped there. A snippet of Lindy's list: "DON'T: Use hashtags to let 'Grammers know that your handbag costs more than they pay in rent in a year, particularly if you're married to the cabinet official who could help make homeownership and true, substantive, generational financial stability accessible for the working class, but probably won't! Instead, try something more relatable, like #selfcare under a picture of you standing next to a horse. (Best not to mention that you own the horse and also the copyright to the concept of horses.)" It's an unfair attack on Louise, who is not an actual part of the federal government (thankfully) and has not asked to be a part of this narrative (@taylorswift). I get it, we are all fed up with this administration, but Louise is not the person to be going after. Hermes scarf and/or Birkin bag? Louise Linton apparently is an actress in her 30s, and likely spends most of her day scrolling through Instagram like the rest of us who don't actually work for the government. This means she probably follows hundreds, if not thousands, of bloggers, who tag and hashtag their Instagrams with the brands they are wearing for maximum likes. 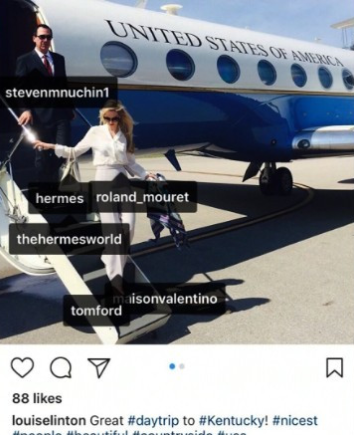 Barely anyone knew who Louise Linton was until now, so she had to get her likes from somewhere, aka other bloggers and people looking for examples of Hermes scarves. Because Louise tagged the brands in her photo, her photo will now show up on that brand's "photos of @thatbrand" section of that brand's Instagram. Because she #hashtagged the brands, her photo will come up in a search for that particular hashtag. Most importantly, IMO, is that anyone looking at her outfit and wondering about the origin of any of the items of clothing she was wearing could simply tap her photo for the outfit credits. Tapping for outfit credits seems like it has been relatively contained to the fashion-blogger community, and those that follow that community. 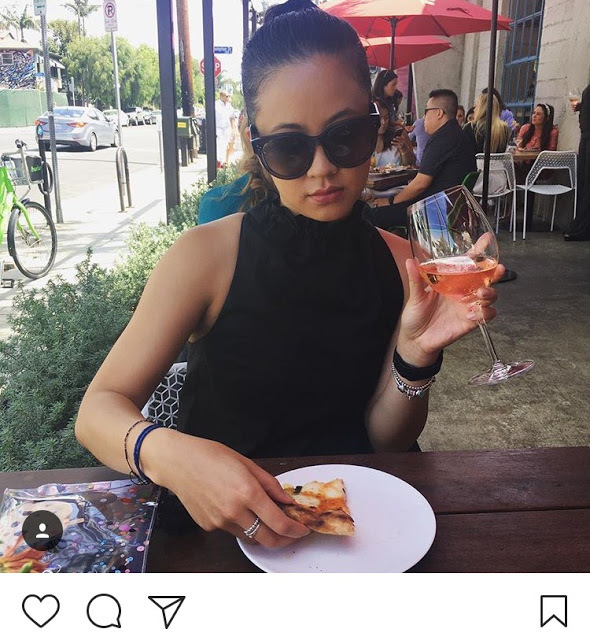 Instead of having to respond to every comment that asks where her pants or from or what brand her scarf is, because Louise tagged the parts of her outfit with the brands, an Instagram scroller merely has to tap the photo to find out. 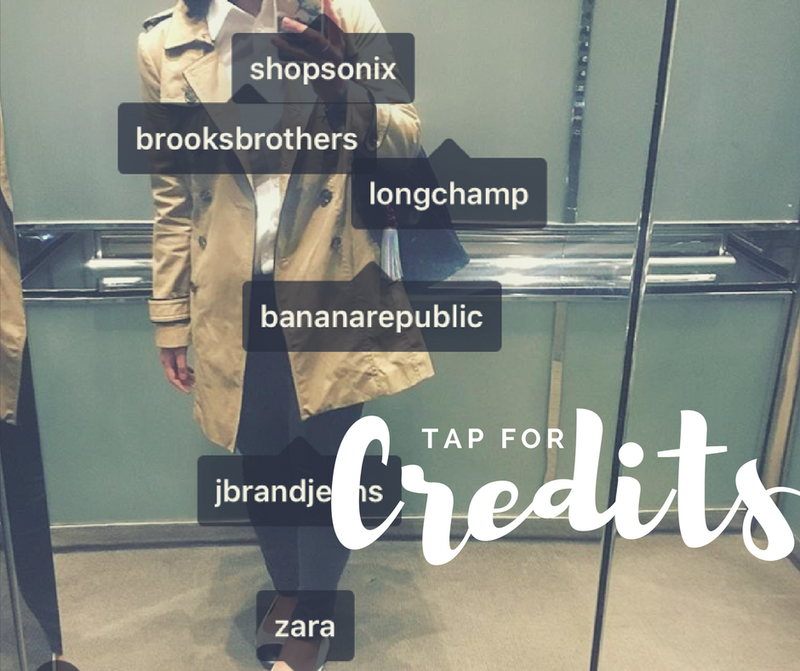 I can understand that the general public, unfamiliar with this sort of "tap for credits" lifestyle, would think that tagging the brands worn is more akin to bragging. It's mostly because the tags are only ever for expensive brands. But let's see, how much of your actual outfit (YOU, reading this) if you took a photo of it, would you be able to tag on instagram? Right now, I'm wearing a black Mossimo sweater from Target, grey J Brand jeans, patent black Louise et Cie oxford shoes, a black Longchamp tote, and a J.Crew scarf (it's cold in LA offices). I can mostly tag all elements of my outfit, because they all have an Instagram presence, including Target. I would probably only tag my jeans, and maybe the shoes I'm wearing because it's not clear where they are from and if I saw this photo, that's what I would be interested in learning more about. I actually found the oxford shoes because someone I follow tagged it in one of her posts. 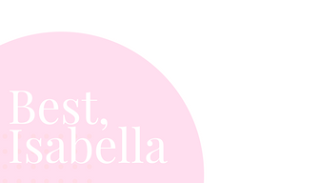 I'm so used to tapping for credits on the posts of bloggers I follow, that if I tap most of my actual friends' photos I can't help but feel a twinge of disappointment if I liked the dress they were wearing and the brand wasn't tagged. Is this sad? Is this another example of our distancing ourselves from others -- tag the brand so you don't have to interact with someone asking where your clothes are from? I'm typically not going to ask someone where their clothes are from in an Instagram post, because it seems awkward and intrusive, and also what if they don't want to tell me? I don't want to be left hanging on an Instagram comment wall! ManRepeller recently posted an article that truly spoke to this: How to Credit a Photo on Instagram/The Rudest Thing You Can Do on Instagram. Another reason that brand-tagged photos are so helpful is that when you are looking for real-life examples of people wearing the things you are interested in buying, you might find them. For example, for my oxfords, I checked the @louiseetcie Instagram's tagged photos for more photos in which people were wearing the patent black oxfords, and what kind of outfits they were wearing them with. It takes some scrolling, but when you want to make an informed purchase, it's pretty helpful. In sum, people need to realize that tagging brands is not merely bragging for bragging's sake. 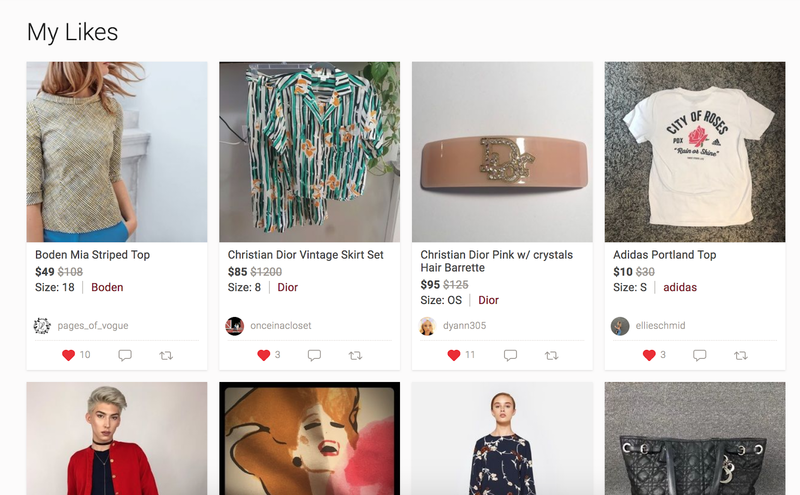 It actually helps people find out where clothes are from (before they have to ask), can help with researching certain potential purchases, and can show new ways of styling certain items from any given brand.